Oh man, there’s never enough hours in the day, right?! I swear getting ready to go out of town always has me feeling like I’m scrambling to get things done before going. I’m sure if you travel for work, you know how it is, leaving the house in the middle of the week. But, I’m honored to be invited back to the BH&G Stylemaker event and super excited to turn the trip into a mini girls’ weekend. Well, we’re just staying one extra day, but I’ll take it! We’ve got a fun agenda and I *think* I know what I’m packing, but I’m sure there’ll be some last minute changes by the time I leave. I’m finally ordered a set of packing cubes– they were a huge hit at last year’s Favorite Things Christmas party and my girlfriends rave about them. They are supposed to help you maximize the space in your suitcase and help keep you organized, so I’m all over it. I even bought a set for the kids so when we all travel together, we’ll be better organized. I’ll show you how I used them after I actually pack everything! But for now, here’s what’s on the list to take! First up, comfort wins for my day of travel and it doesn’t get more comfy than this! I’m obsessed with these crop joggers and slip on sneakers so, I’m going the casual route. Even when it’s warm out, if I’ve ever traveled without my jean jacket, I’ve always regretted it, so it always comes with! We get in around 7pm, so we’ll have time to grab a quick dinner in town (the event is in Brooklyn this time, so that will be fun and different!) and then head back to the room for our slumber party. I’m even giddy about that part- seriously so fun to just relax in the room and catch up on life and girl talk in person! 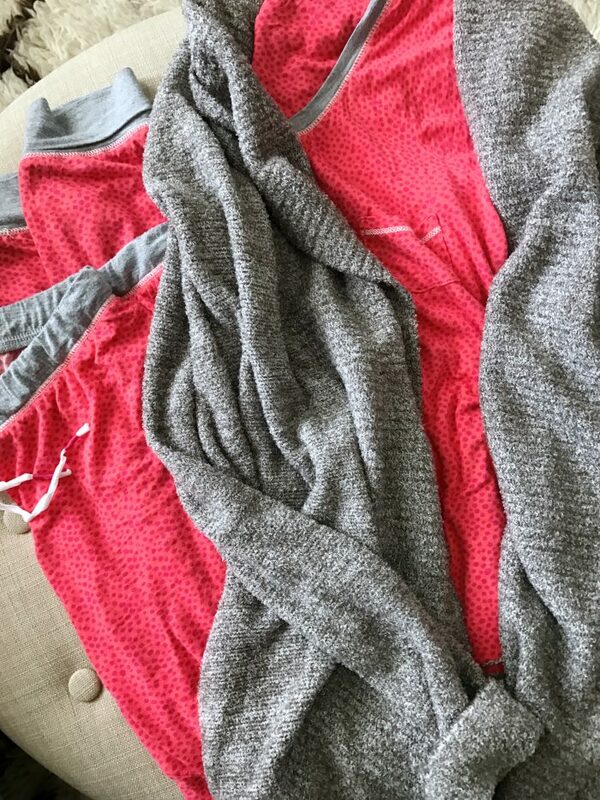 And definitely in these cozy pajamas and cardigan! The main point of the trip is to attend the annual Better Homes & Gardens event on Thursday and they always do it up right with a gorgeous venue, interesting speakers and lots of great takeaways that always inspire me to be a better homemaker and blogger. Y’all chose this tweed shorts romper hands-down as what I should wear to the event! Thank you so much for weighing in and helping me decide! It’s so much more fun to run options by your friends and get their opinion. It’s super darling on and I got a spray tan so my casper legs don’t scare anyone! After the event, we’ll have time for a quick outfit change for the cocktail party and I can’t wait to wear this stunner of a fit and flare dress. The magenta/plum color is so gorgeous in person, much better than the online photo! You can see it on me here, but I had the length taken up since then. It’s so comfortable and the cut is ultra flattering along with that unexpected mock collar. I may try to see how it looks with a skinny leopard belt. I am soooo looking forward to this! We did a walking food tour last year too and it was a wonderful way to see the city, learn some history, and sample tons of food all in a few hours! It was on that trip that I realized I needed a pair of rain boots stat, and I came home and ordered these boots (but the kids’ version!). Here’s my post reviewing a few different pairs (and explaining why I went with the kids) if you’re on the hunt. I’m still amazed at all the opportunities I get to wear them. If it’s warmer, I’ll switch out the long sleeve and vest for a short sleeve top. And finally, the whole reason I bought this crossbody bag– for this trip and other future trips. But, I love it so much and find it so handy, that it’s become my everyday bag! I’m excited that it will fit my mini camera (new version) inside when I unzip the bottom part to expand it. We might be in the nosebleed seats, but we’re thrilled to see Hello, Dolly and then head to dinner at the Polo Club! It’s such a special thrill to get to see a broadway show and I always soak up every second of it! We saw Waitress last year and I highly recommend it! It was sweet and funny and endearing and I do remember crying happy tears at the end. 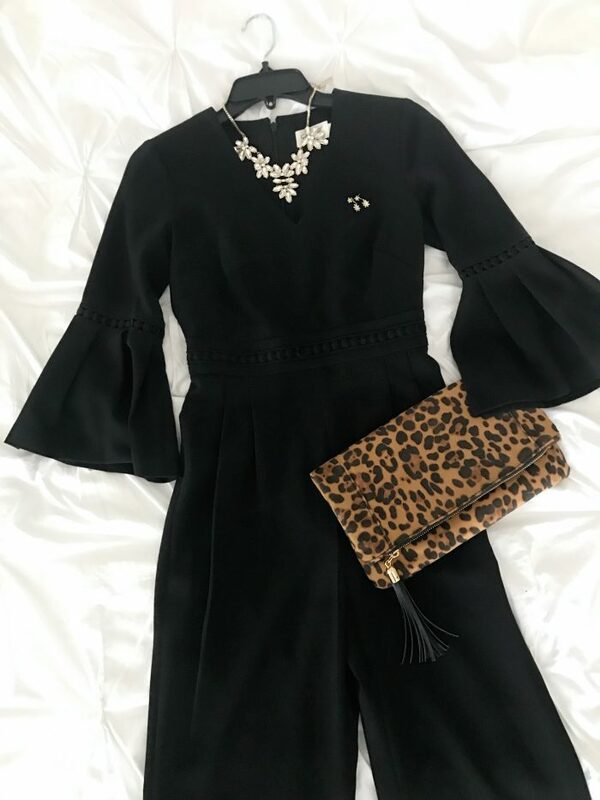 For this occasion, I’m taking this jumpsuit with fun bell sleeves and added detail at the sleeve and waist. The 2P fit perfectly at the top, but the bottom was a little too big, so I got it altered. I like that the sleeve length will let me show off a bracelet. And I’m thinking my black heels with that too. We’ll be cabbing it, so I’m not too worried about walking a lot. We’ll get up early Saturday morning and head home, just in time for James’ baseball game! I wish I could pack you in my suitcase because wouldn’t that be so fun to hang in NYC together in person?! I’ll be sharing the highlights with you on Stories, so follow along! And I’ll be sure to recap it all after I get back! In the meantime, I have a fun Outfits Lately post coming up for you on Friday, full of tons of sales and super cute things for Fall!! See you then! All so cute!! It looks like your military vest link takes me to the Ray Bans. Would you mind updating? 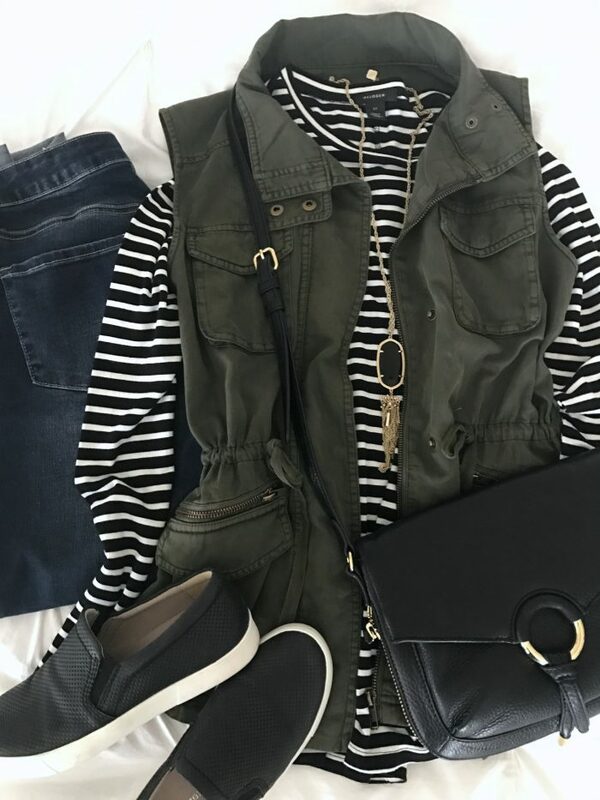 My mom has been on the hunt for a vest just like that! Thanks so much Alexis! I’m so happy to get to go! Hope you have a great weekend too! I actually just got a pair of red kids hunter boots this month. Can’t wait to wear them this fall and winter! Love your packing list! You ate going to look lovely! What brand is your cute suit case? 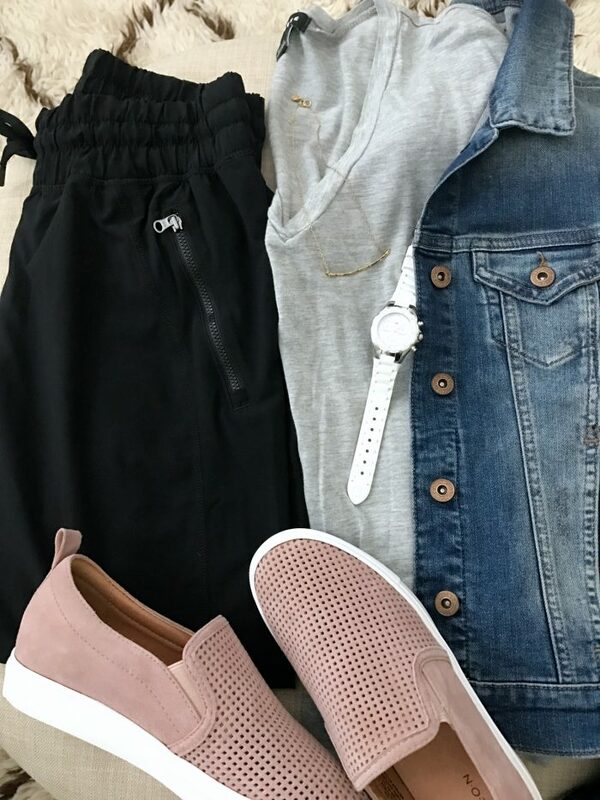 I just scored on your Naturalizer Marianne slip-on sneakers, I was able to get them for $40 on sale! They were so cute on you and you said they were ultra cushy so I’ve been keeping my eye out for them. They are the first pair of slip-on sneakers that felt great the first time I tried them on. I love how the Steve Madden slip-on’s look but for some reason I find them to be an uncomfortable fit so when I tried the Naturalizer Marianne’s on and they were super soft and didn’t pinch my toes, I knew it was a win. Also, they don’t make your feet look huge and too long like some of the slip-on’s. Thanks for the recommendation on this brand and for the heads up on sizing down a 1/2 size! Yah, now I can’ wait for spring. I’m so glad you found that recommendation helpful! I’ve worn mine forever and they’ve held up great and are so comfortable!